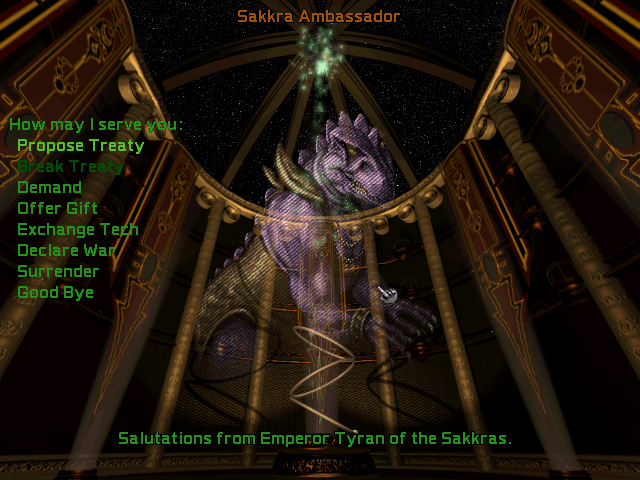 This track plays whenever you're talking to the Sakkra in Master of Orion II, a reptilian race of lizardmen who are sure to be a favourite to any player that loves having huge populations: not only does the Sakkra get a large homeworld to populate, they also have the "Subterranean" trait meaning the maximum population for a planet is increased thanks to the race's ability to build underground colonies. If that weren't enough, the Sakkra are great farmers meaning a +1 Food bonus and due to their "regenerative properties" have a 100% boost to population growth as well! The only disadvantages for the Sakkra are the fact they're inept at spying and their Feudal government (which is apparently not as good as a Democracy or Unification government). The theme for the Sakkra sounds like something you'd hear as background music in David Lynch's Dune, possibly for the Harkonnen (hey the Sakkra have a feudal government so there's at least one thing in common ;))?